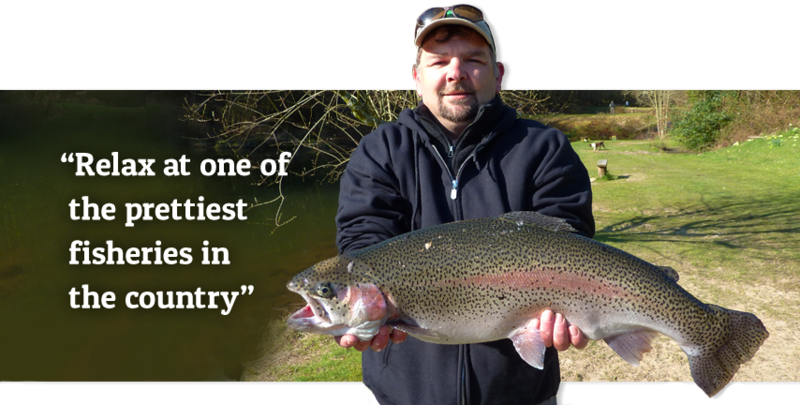 Bellbrook Valley Trout Fishery was created by Major John Braithwaite, who retired to Devon to participate in his great passion – hunting. When the Braithwaites moved to Bellbrook in the early 1970s, the farmhouse was almost derelict and his first project was to extend and renovate the house and outbuildings and build new stables. Major Braithwaite was a passionately energetic and creative man who was always looking forward to his next project. He slept little and used to rise “in the middle of the night” to see to his horses and dogs and during one of these restless nights he conceived the idea of creating a fishery in the boggy valley bottom, fed by a small stream – the Bell Brook. With the help of a local farmer, a builder and his son and son’s friends, in about 1977 he extended Bellbrook Lake and built 3 more lakes and a couple of smaller pools. He also built a fish farm to grow fish to re-stock the lakes. The fishery quickly became established and built up a reputation. By all accounts John Braithwaite was a real character and he used to ride around the fishery on a huge grey stallion. Being ex-army and also a little deaf he used to bellow at his customers from a distance. He was very generous with the genuine sports but totally intolerant of anyone who bent the rules in the slightest. Sadly, he was killed in a car-crash in about 1984. Mrs. Braithwaite sold the fishery to Peter and Margaret Swaby in 1986 and Peter undertook a massive renovation of the fishery, cutting back overgrown banks and the like and improving access. Peter added another lake to the complex and combined the 2 smaller pools to create another lake. The Swabys also started providing Bed & Breakfast accommodation to visitors. Peter and Margaret retired in 1996 and sold Bellbrook to Mike and Lesley Pusey. Once again some renovation was required as it is a very high-care site with water running down through the 2 valley bottoms causing high levels of wear and tear during spate/flood conditions. In 2001 the Fishery was badly hit by the Foot & Mouth outbreak and the owners suffered illness involving hospitalisation hence the decision to sell the fishery in April 2002. The new owner is a relatively “young-un” – Chris Atwell. Having taken ownership of the business in 2002 Chris has now been in situ for 16 years - the longest term as owner since the founder. Since taking on the rather tired property many additional facilities and improvements have been made. Significant investment has gone into the accomodation side of the business and the lodges provided for anglers are second to none. The Ironmill lake was doubled in size in 2007 and is now one of the most popular lakes. With a young family enjoying the beauty and tranquillity of the site Chris is known to be committed to many a year yet at Bellbrook.